We first met when we were both 13 years old at a family/friend get together. For both of us I think we already knew then that we wanted to end up spending the rest of our lives together. We stayed friends for several years before we started dating at 19 years old, 5 years later we were engaged and we set our date to finally marry the following year! 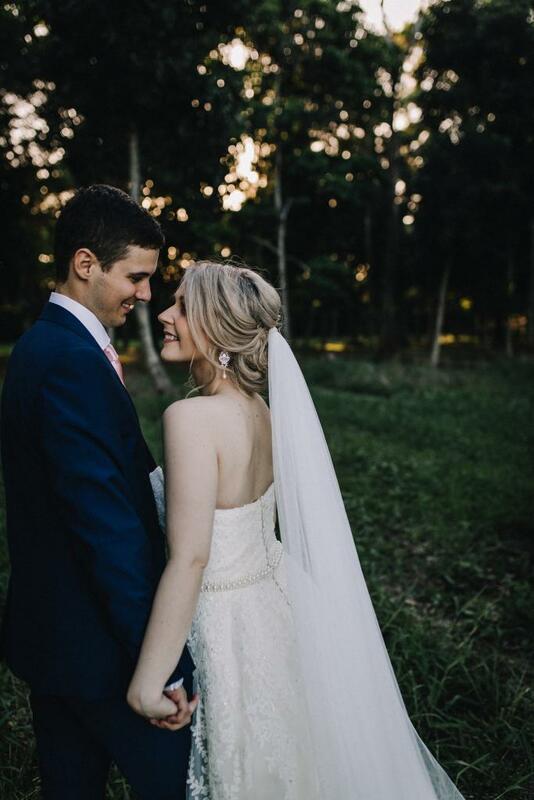 Jonathan planned a beautiful weekend away at Byfield QLD, we stayed in a little rainforest ranch that was just so peaceful. He planned a day trip out at five rocks where we had a lovely lunch picnic in an area secluded along the beach. 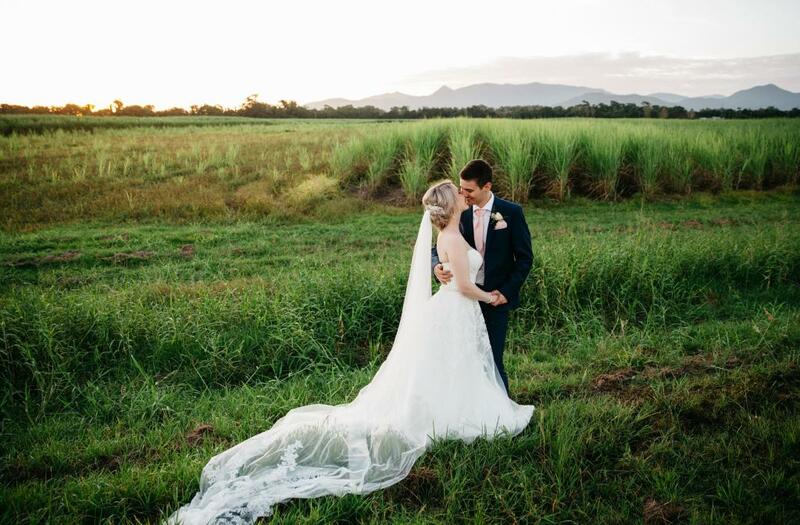 That night we went to a beautiful look out in Yeppoon and he popped the question at sunset! It truly was a magical weekend away. We just really wanted our wedding to be elegant. Jonathan says it was very Gatsby as we had huge flower arrangements on tall candle sticks with lots of pearls scattered around. 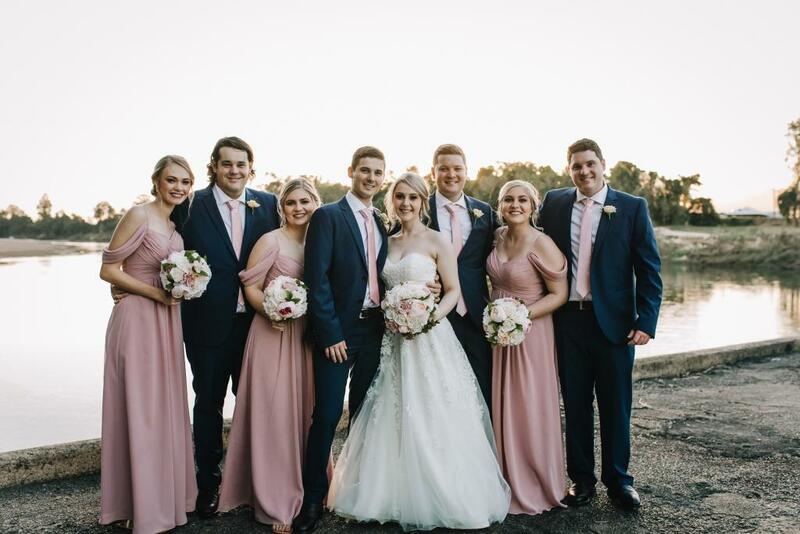 Our colour scheme was soft dusty pinks, whites and ivory. 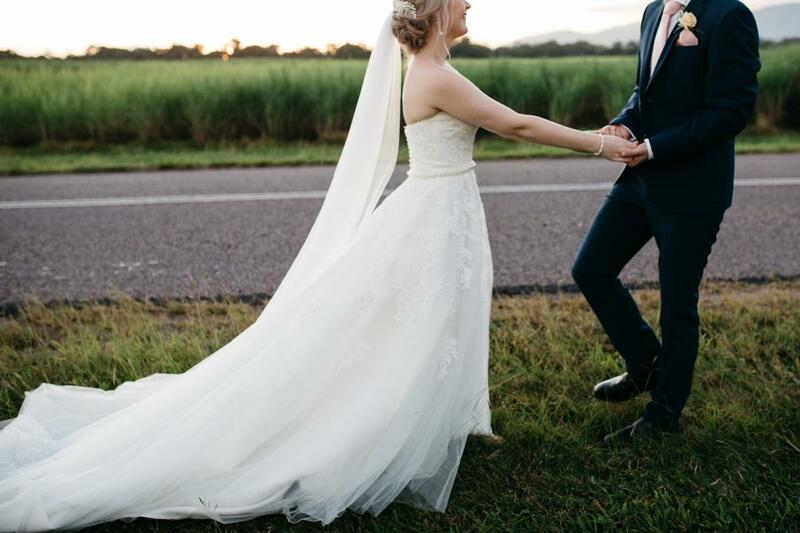 My dress was ‘Sonia’ by Madi Lane – I bought it from Luv Bridal & Formal Brisbane. The ladies there were so helpful and didn’t try and rush me at all. I must have tried on at least 15 dresses. But Sonia was my first dress I tried on in that store. Everything after Sonia just couldn’t compare. 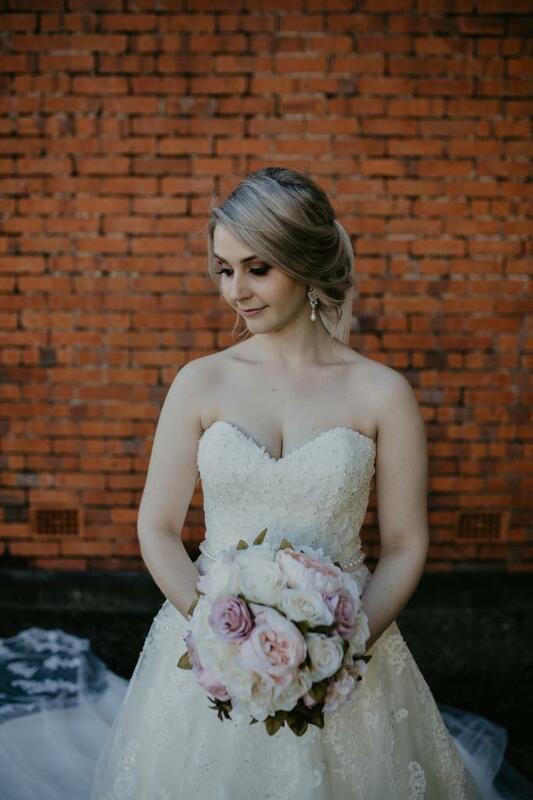 My mother and maid of honour were just so wowed when I walked out in this dress, there was just something so special about this dress. 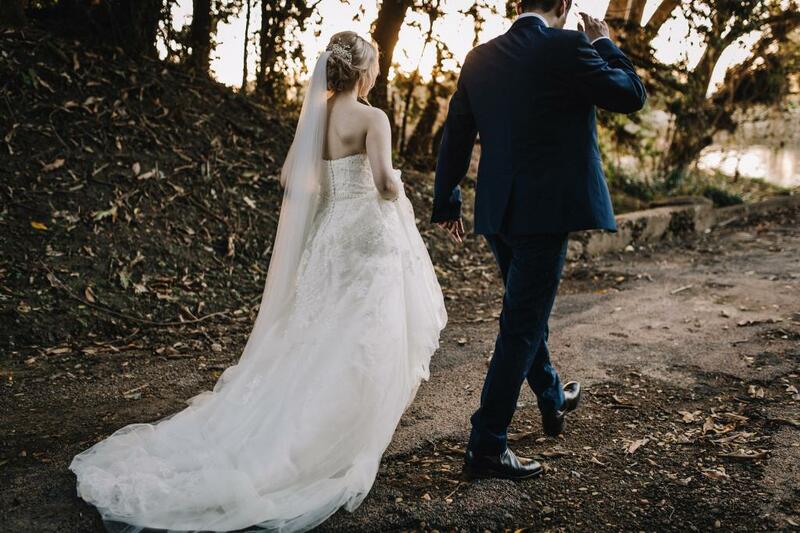 It just made me feel like the bride I have always dreamed of being. Funnily enough a few weeks after I had ordered the dress I was going through my messages on Facebook to Luv Bridal and had asked them if they could let me know the price on Sonia quite a few months prior to going into the shop. I did not remember doing that at all! So it was definitely the one! The best moment of our day was probably when we were announced husband and wife and we shared our first kiss. Jonathan dipped me and everyone cheered so loudly. I still often think back to that very moment and it always makes me smile. We had such a variety of music from Christina Perri, Ed Sheeran to Powder Finger & The Killers. We wanted music that we both enjoyed to be included in our day. Our photographer and her assistant Amy & Jacinta from Amy Grace Photography, Amy was so lovely and professional. She just made us feel so comfortable. Half the time I didn’t even feel like we were getting our photos taken. Especially in the morning getting ready. There are so many great photos that were taken that I didn’t even take notice of her photographing them! I’m not too sure if we done anything unusual. Probably besides me doing everyones hair in the bridal party including myself! Our photographers thought I was crazy! But being a hairdresser myself I knew what I wanted to do and knew I could trust myself to do them all! But it definitely took my mind off being so nervous while we were getting ready! We have a few big years ahead of us with renovating our house we bought a few years ago! Definitely looking forward to getting it finished so we can start expanding our family! Definitely don’t stress about the small things. Gosh I was sick all day with glandular fever but still somehow managed to have the best day of my life! 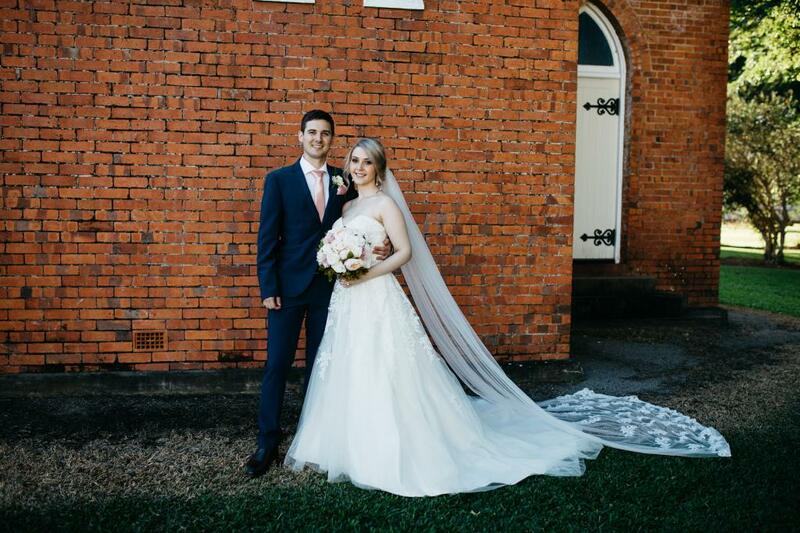 If I could do one thing differently, It would have to be getting 2 people to film our wedding ceremony. We just had a family member recording off to one side as we didn’t have a professional videographer in our budget! And unfortunately the video had stopped recording right before our first kiss. You know that one I mentioned above that was the best part of our day! Luckily we have some great photos of it! The best moment of our day was when we were announced husband and wife and we shared our first kiss. I still often think back to that very moment and it always makes me smile.